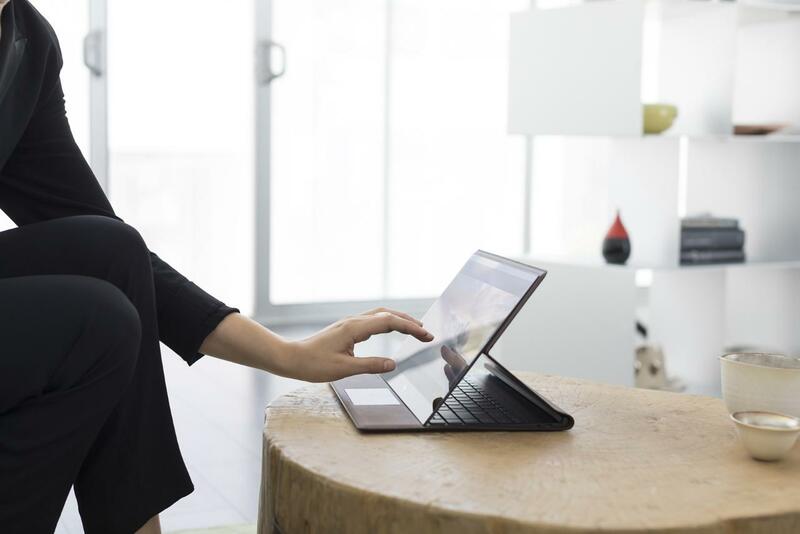 This is the HP Spectre Folio. Unveiled in an over-the-top press event in Manhattan today, which included such turns of phrase as “aluminum has become the gold standard,” the device is a convertible laptop with a leather case. As HP put it at the event, “this isn’t a PC that’s wrapped in leather, it’s a PC that’s made of leather.” So, what does that mean, exactly? Rather than covering the standard aluminum or plastic, the cow skin serves as both the chassis and hinge. Weird, right? Another quote from the event: “It makes you feel a certain way when you touch it. It makes you feel a certain way when you smell it.” Not a thing I expected to hear when I headed to the city for an HP event this morning. Point is, HP embraced something called “manucrafturing,” in the equally bizarre words of its press release. The laptop has a 13.3-inch pen-enabled touch screen and an Intel Core i5 or i7 processor inside. There’s 16GB of RAM and up to 2TB of storage. The battery should get up to 18 hours of life on a charge, according to the company — admittedly pretty solid. Pre-orders start today and the decidedly un-vegan-friendly device is expected to start shipping before the end of the month. Pricing starts at $1,300 for the i5 version. You can practically smell it.